Our first confirmed interstellar visitor was a tough nut to crack. Scientists puzzled over ‘Oumuamua when it appeared in the sky last year. The classification flipped back and forth a few times before eventually landing on “comet,” but it’s a weird comet. Now, researchers from the Harvard Smithsonian Center for Astrophysics have revived the idea that ‘Oumuamua could be an alien spacecraft. While we’ve recategorized ‘Oumuamua a few times, we can say with utmost certainty that it came from another solar system. It has an orbital eccentricity of 1.20, which is far past the sun’s escape velocity. Nothing in the solar system could reach that speed naturally without a cataclysmic release of energy that we would have noticed. ‘Oumuamua was already on its way out of the solar system and moving at high speed when we spotted it, so there was no time to build and launch a mission to intercept it. We haven’t even gotten a very good look at the object. 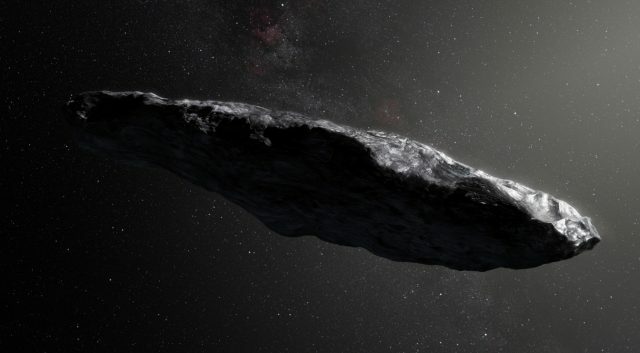 Scientists believe ‘Oumuamua is cigar-shaped and up to 120 meters in length. That’s an unusual shape for an asteroid (at least in this solar system) so the discoverers initially categorized it as a comet. Then, scientists looked closer and saw no coma, the cloud of dust and gas that surround a comet when it nears the sun. So, an asteroid? Upon even closer examination, researchers found ‘Oumuamua’s orbit was being nudged by a force consistent with gas release. Currently, ‘Oumuamua is considered a low-activity comet. The newly released paper (which hasn’t been peer-reviewed yet) suggests another option. What if the small force acting on ‘Oumuamua is not from gas release? The study suggests that ‘Oumuamua could have an odd orbit because it’s an alien space probe with a solar sail. A solar sail is a concept for a low-power propulsion system currently in testing at a number of companies and space agencies around the world. The sail would use the pressure of the solar radiation to propel a craft forward continuously. Over time, a solar sail could reach high speeds, possibly even leaving the solar system. The researcher making this proposal are not presenting evidence that ‘Oumuamua actually has a solar sail — there’s no way to know that with current technology. Instead, they seek to demonstrate that it is possible based on what we know of the physics of solar sails and the orbit of ‘Oumuamua. The study concludes that it’s possible that ‘Oumuamua is being dragged along by a solar sail, but that doesn’t necessarily mean it’s an active alien probe. Researchers scanned ‘Oumuamua back in 2017 to look for any electromagnetic emissions, finding nothing. At that point, they deemed it not an alien ship. The new study suggests ‘Oumuamua could be non-functional debris with a bit of light sail material clinging on. Alternatively, it could be a probe in a low-power mode that we cannot characterize. Unfortunately, we’ll probably never know for sure what ‘Oumuamua is — it’s already long gone.